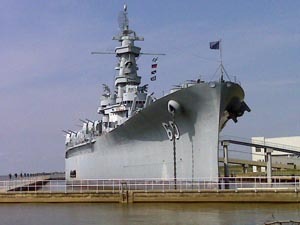 Started with a Flag Day visit to the USS Alabama in Mobile Bay with full intentions of making Jacksonville tonight. Not to be. After several hours of hot and humid riding, stopped at a rest area for a soda right after changing time zones. That's when the rumbling started. Black clouds zoomed in as gusty winds zipped in and lightning slashed the sky for an hour. So here I sit in Tallahassee--dry but 200 miles short of my goal. Retirement means not having to ride in the rain so you can get back to work on time! Probably will make it tomorrow. Maybe.